Examples of mechanical systems with hyperbolic chaos are discussed, including the Thurston–Weeks–Hunt–MacKay hinge mechanism, in which conservative Anosov dynamics is realized, and dissipative systems with Smale–Williams type attractors (a particle on a plane under periodic kicks, interacting particles sliding on two alternately rotating disks, and a string with parametric excitation by modulated pump). 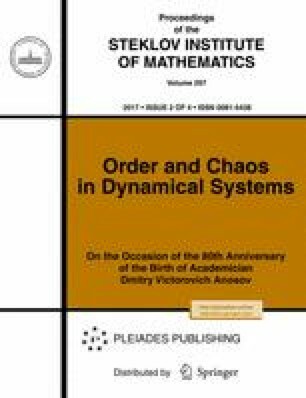 The examples considered in the paper are interesting from the viewpoint of filling hyperbolic theory, as a well-developed field of the mathematical theory of dynamical systems, with physical content. The results of computer tests for hyperbolicity of the systems are presented that are based on the analysis of the statistics of intersection angles of stable and unstable manifolds. Original Russian Text © S.P. Kuznetsov, V.P. Kruglov, 2017, published in Trudy Matematicheskogo Instituta imeni V.A. Steklova, 2017, Vol. 297, pp. 232–259.